Use the key to colour the cakes the correct colours, then decorate them with stars and glitter and give them some fairy magic! 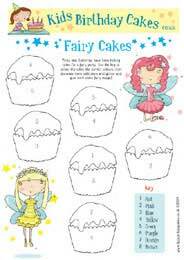 Why not Download the Fairy Cakes Colouring Puzzle and see how magical you can make them! This activity is aimed at 3 to 7 year olds, it's a fun way to raise your child's interest in cooking, as well as building their creative and problem solving skills.